Sjöström’s silent morality play proves a classic example of style over substance (and not in the pejorative sense). Based on a popular novel written as a hygienic diatribe against “consumption” (TB, not the modern economic basis), The Phantom Carriage employs a notably intricate, flashback-laden structure to convey its simplistic moral message. As midnight on New Year’s Eve approaches, a dying Salvation Army volunteer, Sister Edit, feverishly expects a visit from one David Holm (Sjöström). Concerned friends conduct a search in vain. Elsewhere, the man cavorts with drunken cronies, sharing a bottle among the gravestones in a cemetery. From there, a series of narrators fill in the back story: David was Sister Edit’s first charge, taken in a year ago, who repaid her with contempt and spite (giving her TB in the bargain). Through the year, she tried in vain to change his wicked ways and, in the process, fell in love with him. (Naturally.) David, however, has a wife and children who occasionally bear the brunt of his drunken displeasure. In one memorable scene, his wife locks him in the kitchen, while she bundles up the babes. He breaks out with the help of a handy hatchet. (It has been said by some critics that this scene influenced Kubrick in The Shining , but it’s just as likely he was thinking of Griffith’s Broken Blossoms .) 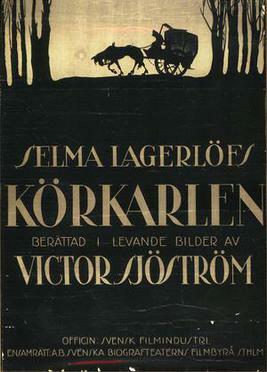 Onto all this Naturalistic pathos (whether derived from Zola or Strindberg), Sjöström imposes a supernatural frame—the last soul that dies on New Year’s becomes Death’s carriage-driver—that provides some of the film’s most striking imagery: the carriage retrieving a dead soul from the ocean floor is particularly evocative. The proto-surreal trick-photography effects, as well as the film’s visualization of Death (his driver, actually), were supposed to have been formative influences on a young Ingmar Bergman, who would repay the debt by using similar imagery in one masterwork The Seventh Seal (1957) and starring an elderly Sjöström in another, Wild Strawberries (also 1957). While many samurai films set their action toward the end of the shogun era, establishing a elegiac, “passing of an era” atmosphere (for instance, Takashi Miike’s recent 13 Assassins), Kobayashi sets his anti-authoritarian dismantling of the genre at its origins in the early 17th century, suggesting that the feudal Japan so often lionized or lamented in other films was rotten to its core and from the start. (The Iyi clan’s famous red armor, seen at film’s start and finish, may be impressive—imposing, ornate, ferocious-looking—but it’s also quite empty.) The complex flashback structure is carefully imbricated, each narrative strand (which extend to stories within stories) sheds new light on what has gone before, providing an ever-shifting focus of identification and sympathetic investment for the viewer. Kobayashi’s visual style alternates between fixed-camera static shots (Ozu-inflected, no doubt) and mobile tracking shots, and often the shift seems motivated as much by affective content as it is by aesthetic considerations. (Which considerations include an apparent love for frame-filling, fixed geometrical patterns.) Rendering the personal tragedy of the main characters even harsher (and more resonant), the film suggests that all records of the events will be expunged or emended to conform to “the official story.” As much as it valorizes the act of making a principled stand against the caprices and injustices of unchecked authority, it also makes plain that these private rebellions will meet with failure more often than not, effectively leaving the structures of power untouched. Routine screwball farce teams Cary Grant and Irene Dunne as warring exes who, of course, still harbor a hankering for each other. In and of itself, there’s nothing wrong with the setup (see The Palm Beach Story  for Preston Sturges’ superior take on the trope), it’s just that The Awful Truth doesn’t do anything extraordinary with it. Amusing more than riotous, there’s really only one standout sequence: Having had her own prospective suitor (Ralph Bellamy) disposed of via Grant’s machinations, Dunne returns the favor by posing as his dipso sister in the company of his heiress fiancée and her snooty parents. For five minutes or so, Truth isn’t so awful, since it lands as many laughs as it misses. By the end, alas, the film’s squandered whatever goodwill it built up in that scene and ends with a whimper, a true groaner of a gag (involving animated cuckoo clock automatons, of all things!) that renders the conventional happy ending even less tolerable than usual. With Moonfleet, Lang inaugurates a new subgenre. Call it “Cinemascope Gothic.” At bottom a second- or third-rate adventure yarn in the R. L. Stevenson vein (Treasure Island, Kidnapped)—complete with spirited young protagonist, a brooding, Byronic “hero” (Stewart Granger), smugglers’ coves, hidden treasure, etc—Lang lends some mood and local color (Eastman Color, that is) by investing the mise-en-scène with the trappings of late 18th century Gothicism—a ruined manor, gloomy churchyard, cobwebbed statuary. Despite his evident dislike for the widescreen format—dismissing it as fit only for “snakes and funerals”—Lang makes the most of the frame’s horizontality: from banquets and gambling parlor scenes to a swashbuckler-style brawl in a pub. Beneath the picaresque theatrics lies a kernel of social criticism: the aristocrats, in particular Lord and Lady Ashwood (George Sanders, Joan Greenwood), are portrayed as decadent, scheming and rapacious. This entry was posted in film, movie reviews and tagged 13 assassins, a fistful of dollars, a song is born, akira kurosawa, august strindberg, ball of fire, barbara stanwyck, billy wilder, broken blossoms, cary grant, d. w. griffith, danny kaye, dashiell hammett, el dorado, emile zola, friz lang, gary cooper, george sanders, hara-kiri, howard hawks, ingmar bergman, irene dunne, joan greenwood, john ford, last man standing, leo mccarey, masaki kobayashi, moonfleet, preston sturges, ralph bellamy, red harvest, rio bravo, rio lobo, robert louis stevenson, sanjuro, sergio leone, snow white and the seven dwarfs, some like it hot, spaghetti western, stanley kubrick, stewart granger, takashi miike, the awful truth, the glass key, the palm beach story, the phantom carriage, the seventh seal, the shining, toshiro mifune, treasure island, victor sjostrom, walter hill, wild strawberries, yojimbo. Bookmark the permalink.